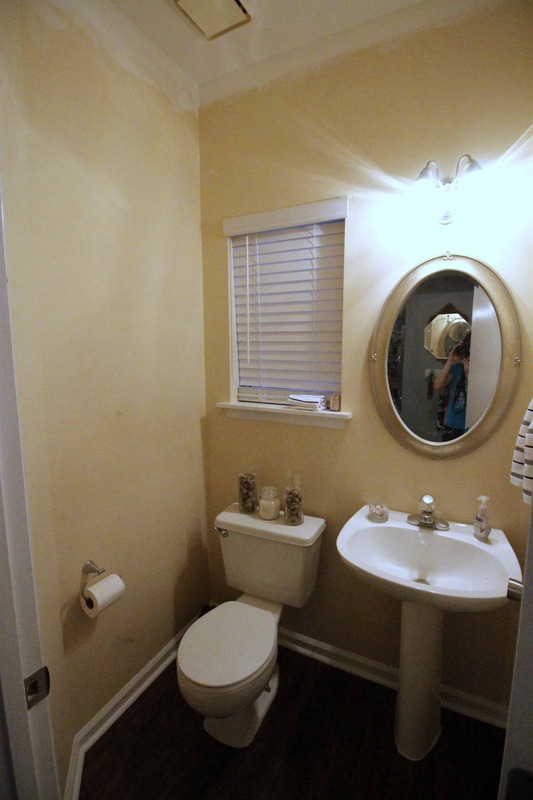 Before I get started, I know what you are thinking: half bathroom design plan? But you are in the middle of a kitchen renovation? But not really. We are kind of almost at a standstill with the kitchen as we wait for our counter tops to be poured and installed. It ended up taking us a bit longer than anticipated to lock down an installer, so we are a week or so behind our intended schedule. So why not take a week off? Well, we kind of are. But at the same time, I heard about the March $100 room challenge and wanted to participate, of course. What is the $100 room challenge? We will be tagging up with a big group of bloggers who are all making over one room in one month for $100! I will be updating you on our half bath progress for the next four Wednesdays, ending with a reveal. I knew that this space would be great for the $100 challenge because all it needs is cosmetic work. We just had the new flooring run in here and it is the only room on our first floor that is unpainted. The biggest problem with this room, other than lack of decor, is lack of storage. It’s a pedestal stink and so we are going to have to be creative about a spot for extra toilet paper and cleaning supplies. Here is our vision for the space. paint color – I took an Instagram story poll the other day (if you don’t watch my stories, you should. I post a lot!) and asked if we should continue the Online gray in there or match the island with Watery blue. 100% of the responders (and I had a bunch!) said watery. I was glad to have my idea confirmed! light fixture – in the spirit of the challenge, we are going to work with what we got and update it with a coat of paint. We learned in our bedroom how much changing the glass shades can update the space, so that is the plan here, as well. Keep tuning in – we can’t wait to share how to goes! And be sure to check out all of the other blogs that are linking up! 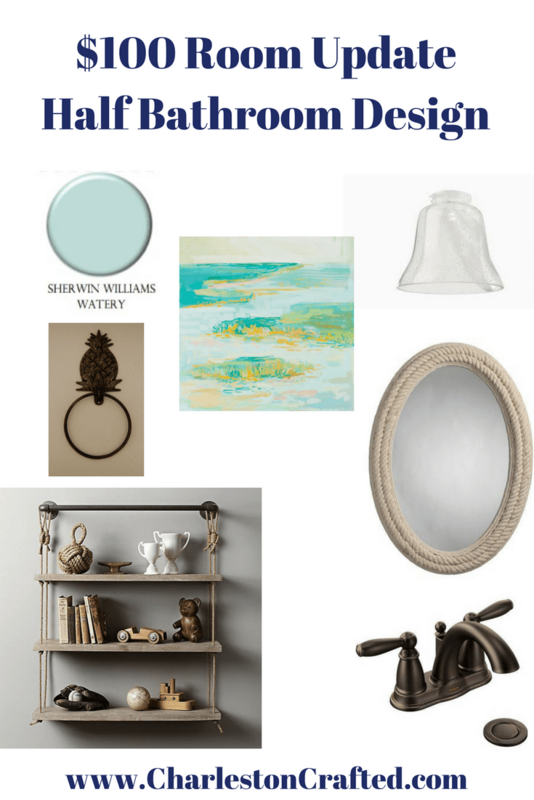 Watery is one of my favorite paint colors! It’s going to be gorgeous! My favorite thing about the $100 Room Challenge is that it shows that we all have those rooms that need attention. No matter how many gorgeous rooms we have, there is always that one. 🙂 I love your plan and I think it will turn out great! That’s so similar to the color we painted our half bath! I love it. And the shelf is going to look gorgeous against it. Can’t wait to see how it turns out! 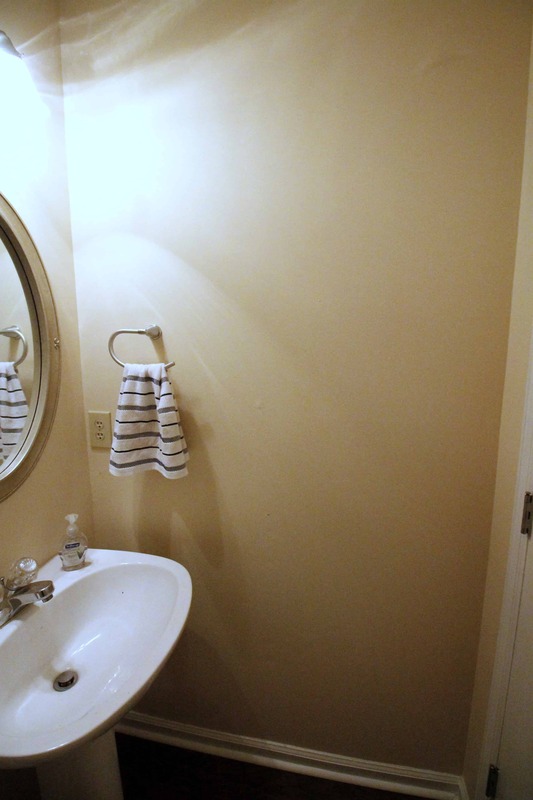 That vanity will look amazing painted white! Can’t wait to see how it turns out! whoops sorry! I was reading two posts at the same time and waiting for the one to load. no vanity in your bathroom. Lucky you in finding that ORB faucet in the garage – I need to find one of those for my bathroom I am working on. 🙂 That shelf looks amazing! Can’t wait to see it all pulled together!